You can stay upto 180 days in India. It is valid for Air travellers and Cruise travellers. You can travel whole of India except Andaman Islands. Minimum time required to get you e-Tourist (eTV) visa is 24 hours. Minimum time required to get you Regular Tourist visa is 3 days. 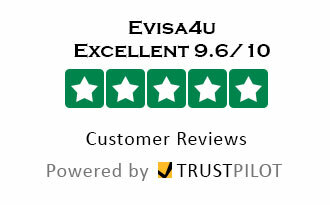 All our customers endorse us for our highly professional service, read our reviews by clicking on the link evisa4u reviews. Check our service details and book now. They got our visa done in 24 hours without any hassle, highly recommended service. evisa4u helped us in getting our India visa sorted at the right time and their process was very easy to follow, we just submitted our passport copy and 1 photograph and our visa were ready next day. Planning our trip now, happy to use them. Thank you so much for whole evisa4u team! I had my flight booked and I didn’t know if I needed a visa. I was searching on internet and found them. The best thing was they are in UK so you can quality service. I told them about my issue, all they asked me is to email my passport copy and any photo. I emailed them and within 10 mins they called me and filled the form on the form. I was relieved!! And guess I had my visa in less than 24hrs!! What a fantastic service. They emailed me visa which I took print off and work was done. They calmed me down when I was panicking which is very good. I will recommend my friends and families to them and will certainly use them again as I couldn’t have asked for more. Thank you evisa4u. Fantastic service , very quick and efficient, with excellent communication. I would definitely recommend this company and will use them again in the future. I needed a Visa for India. I called on Saturday afternoon and had my Visa in 36hrs. EVisa4u kept me in the loop and even called back on Sunday afternoon to check I received the email. I was able to travel on Monday first thing. Thank you again. I would like to thank you for your prompt action in completing our evisa application for myself and my sister. I have been trying to complete the process myself through the India.gov site, which kept closing down, running out of time, difficult to complete in places, and finally having to contact India re issues with their web site, which was costly. I wish I had just used your site to start with, so easy to complete, fast, efficient, and complete within 3 days for my application, and 2 days for my sisters, very impressed and would recommend you to anyone wanting support to complete their evisa. Thank you for your wonderful support/service Janet. Brilliant service, I made a few mistakes on my form..Which they phoned me to let me know, Can not fault them out all. I would HIGHLY RECOMMEND their services. I was delighted to come across evisa4u after having our applications 'rejected' due to problems with the photographs on the Indian government site. As a result we lost the money we had paid. Evisa4u has a very simple questionnaire which you fill in on e-mail, attach your photographs which they will resize and format for you, and voila! E-visa received by e-mail three days later. Completely stress free and for a very reasonable sum. The company recommended by our cruise company quoted me twice the amount (each) charged by evisa4u. Would have no hesitation in recommending them Thank you evisa4u. A fantastic experience. My husband and I somehow managed to forget to apply for a visa and with less than 13 days to go we went online to Indian website but it just wouldn’t accept our payment. Found evisas online and booked a face to face appointment in Greenford. Easy to find and park. Brilliant simple service we paid £13 more to obtain a 24 hour service. We thought as we saw them on Friday it would arrive on Monday, but no within 24 hours we had our visa. Can’t recommend this company enough. Will use again. They took all the stress away. Back then looking forward to our holiday. Thank you so much. I have used this company twice and both times the staff especially Meg have been very helpfull, made getting a visa stress free, 2 to 3 days and got visa, would highly recommend this company. Once again thankyou Meg. Excellent service. Kept me well informed and only took a few days to get my visa. Thanks Shaun for being so helpful. Recieved excellent service, would highly recommend to others. Polite and helpful staff alllowed for easy and efficient visa applications. This has to be the BEST SERVICE I have come across. Last minute flight booked Monday afternoon for the next day. Needed a Visa in LESS THAN 24 HOURS. Spoke to evisa4u and they applied for the Visa around 5pm and I had it the next day by 1.30pm, plenty of time before my evening flight. The TEAM AT EVISA4U WERE GREAT. Very professional, sorted out any mistakes I had made to make sure the application was perfect. They kept me updated and I felt THEY WENT ABOVE AND BEYOND to make sure I had my Visa in time. THANK YOU FOR YOUR AMAZING SERVICE. thankyou for the stress free service. Great service, mega quick turnaround, received today after applying only a few days ago,have used this service before and they will always be my 1st choice, excellent ! After floundering around trying to get a visa for India I came across this web site. I was impressed from the start as they rang me back due to missing my call and I hadn't even left a message. Shaun made the process really easy and nothing was too much trouble. I sent the required details on 4th May start of bank holiday and received the 4 visas on the 7th. I cannot recommend this service highly enough and another good point is you know exactly what you have to pay at the outset. Very easy and quick. Excellent service. A very quick service and I would use them again. Applied for evisa through this site early afternoon, and next afternoon evisa approved and sent via email. 1st class service. Very easy to use website extremely efficient and just made the whole visa application so much easier. I tried to do it myself but the official visa website is so complicated I gave up the will to live. Also beware there are a lot of scam websites advertising to get visas for you. Thank you I will certainly recommend you. Despite a few IT issues at our end, Shaun was patient and always helpful. Evisa arrived in three days.....Will use this company again and have no hesitation in recommending evisa4u . We saved £152 (!) using this site as opposed to other well know high street visa service providers !! Thanks to all at evisa4u. great service from shaun and his team. We could not have wished for a better service. We went to the office on a Thursday, met Shaun, who was most efficient and charming, and he completed the applications (2) in 20 mins.The visas were expected after 3 working days, but arrived on the Sunday. Excellent service, I use them all the time when processing my Indian VISA application and fully recommend it so as to avoid unwanted delays / confusions from the issuing authorities. An amazing customer service with a lot of patience for all the cluent's doubts about visa procedure. The cheapest I found in the e-market. Very efficient and trustworthing service. I honestly recommend.! It is second time I used their service: Perfect! Fast and professional. Well done!! A much better experience than the last time I applied for a visa with a different company . Much easier and true to their word arrived quickly . no worries . This is the third time we have used evisa4u for India visa. They always exceed our expectations. Easy online application process and London based office with amazing customer service. We ordered our visa on sunday and received them in just 2 days. Thank you evisa4u team. Very reluctant to go through an agent as heard of so many scams, but after a whole afternoon trying to use the government website, I finally relented. What a relief !! A kind patient person on the end of the telephone everytime I stumbled over a question. Received visas for myself and my husband two days later. Would recommend. A simple & straightforward procedure. When you consider that you save approximately £12 by not having to provide visa photographs, the service charge is only £12.99. Never again will I struggle with VFS Global's rubbish website! Fantastic service ! Would use again ! Will highly recommend their service ! After having my e-visa declined by the official site with no proper explanation and no support, unanswered emails and extreme stress, evisa4u was such a welcome, simple, speedy and stress-free process. I cant thank Sean and his team enough. With the hassle of going via the Indian Embassy web site evisa4u is the only way to get your visas! I received our visas within 48 hours! How great and trouble free is that. Great and quick service. Would highly recommend. This company lives up to bits word! We had terrible problems attempting to do our Indian Visas. So gave up. Then by chance we found this great company, who did it for us and returned it in less than 72 hrs. And it didn’t cost us a fortune either. I highly recommend them. Do not use any other company as there as so many people proclaiming to do this work and are frauds. So thank you very much for the wonderful service Gillian Evans Mid Wales. What a great service this company does. Wonderful and very professional people. I would recommend to all. I will use then again. Efficient service. Not too expensive. Helpful, actual person answered the UK phone number. I used evisa4u on recommendation and can now understand why. Totally stress free and easy. Vfs (so called government authorised third party to issue visa) advised me not to travel with first British passport of my children..! Without surrendering Indian passport (never been used before). But Vfs could not give me sooner appointment just for surrender (the Indian passport) Pls note vfs charges £144 each passport surrender application..! So wait for this surrender certification then apply for 6-month visa (around £65) but this would take easily 3 weeks ( my easy calculations) Called up EVISA4u people, got visa in 2 days..! Already in India now with children..! Though I submitted my child’indian passport at vfs (UK) but I never bothered to wait for certification to come..! Cost me £109 per child visa but so much hassle free worry free. God. Also evisa arrival line was nothing in comparison to other immigration check lines at the Indian airport. Got sorted in 5 min..! There were queues for normal arrival and types of visa.. but e-visa immigration check was like premium.. so delighted I took this service.. though visa is valid for 60-days but I don’t mind.. thank you Guys. 100 percent satisfaction, Excellent customer service, we have been using them from last 3 years and they always provide wonderful visa service at a very low price. Their office is based in Greenford which is not far if you wish to drop off your documents, we did when we applied for our visa. Waiting at airport for email for visa as we didn’t realise you couldn’t get it at the airport. Shaun was amazing yesterday trying to get it sorted for us as flight is this morning. Fingers crossed that email with visa comes before our flight is due! Definitely recommend this sight. We now have our visas well within the 24hrs and rebooked our flights. Thank you for all your help. After stressing about missing the 72 hour deadline on the official site we trawled the internet looking for a 3rd party company that offered a fast track service but wasn’t going to rip us off. It was so easy to use, the cheapest I found & completely took the stress out of our last minute plans. Would definitely recommend. After struggling applying for India visa, we contacted evisa4u, their application process was very simple and the charges are very low as compared to other websites who operate from abroad. Thanks to evisa4u a London based company dealt with our applications and visa were ready in 2 days. We have already recommended them to our friends. Great simple service and super fast ,compared to 10 hours trying to do on Indian visa website .money well spent with time wasted there . This company was recommended to us by our friends. They are very efficient and friendly, we received our India visa next day. Excellent customer service, ready to fly now for our holidays. Thank you evisa4u. As a worldwide trusted partner, we specialise in simplifying and processing visa applications for India and China, by providing a Simple, Fast and Reliable service for all your visa needs at a guaranteed lowest price. We make sure that we simplify your visa application process by working as your local partner based at London (UK), rather than just an agency. We are easily approachable and we use simple terminology during the whole process of your visa application rather than using technical jargons like other agencies. You can trust us for secure and quick visa application service. Excellent service at a guaranteed lowest price.